I am always on the hunt for a fun new blog or website to add to my ever-growing list of daily reads. I have a handful of blogs & sites to which I am fiercely loyal (or as loyal as one can be to a blog anyway), and I go out of my way to read them every day, or as often as they post. Below are my favorites in the home and wedding arenas. We will post more of our favorite blogs & sites on other topics in future posts - stay tuned! Oh.My.Gosh. This is, without a doubt, my favorite home blog, even though their style and my style are not 100% in sync (they are a bit more modern; I am a bit more cottage). They have impeccable taste and are committed to the seemingly impossible ideal of creating and then blogging about sustainable, budget DIY ideas that look anything but. Plus, their writing is sharp and fun to read, and their site is perfectly organized and maintained. They post twice a day, every weekday. I warn you: the site is addictive. 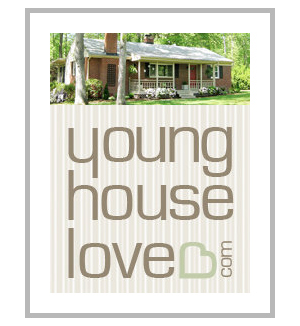 Similar in concept to Young House Love, The Lettered Cottage is the blog of a designer who has creative, lovely ideas for her super sweet cottage home. The style in this blog is a bit more like my own than Young House Love, and I'm always itching to see what projects she is tackling this week. My favorite feature is her unique approach to before & afters: simply move the cursor over certain pictures and those pictures will instantly change from the before to the after and back again. Way cool. She posts a lot of videos, which are great as they show step-by-step instructions for several of her projects. She post a few times per week. Oh how I love this site. Fabulously creative DIY projects that tend toward the modern side. I especially love their "before & afters" section. Tons and tons and tons of eye candy and inspiration here. And now they've added a recipes section. Danger, my friends. Danger. Design*Sponge updates several times per day. Hands-down my favorite wedding blog out there and my go-to source for inspiration and ideas for events. The site is pretty and feminine, and the writing is effusive and sweet. Style Me Pretty posts a wide variety of weddings, though the style that seems most prevalent on the site is a more vintage-inspired, rustic-elegance type wedding. 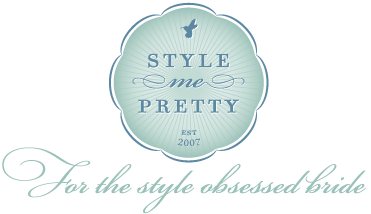 Style Me Pretty posts between 3 and 5 times per day, every weekday. The best feature of this site, in my opinion, is the bevy of inspiration boards. There are over 400 of them (you can search by topic). I never fail to be inspired by the boards she puts together, and often just one picture in her inspiration boards is a jumping off point for me in creating an entire scheme for an event. Anyone who has made a style board/mood board/inspiration board knows that they are far more challenging to put together than they appear. Those on Snippet & Ink are truly inspired and visually beautiful. She posts once or twice per day, every weekday and often on Sundays. My list of wedding sites could not be complete without a mention of the one who got it all started: Martha Stewart. She had a wedding-devoted section of her website long before blogs were a glimmer in the eye of the Internet. She had it all back then and has it all today: countless inspirational photos, real weddings, creative DIY ideas, templates for projects, and an online community (where I met 35 very dear friends back in 2001 - friends I am still close with to this day! hi wedding friends!). So those are my faves -- the blogs and sites that I am sure to check out when I have my second cup of coffee and log on the computer and have a few minutes before my day begins. What about you? Any home or wedding blogs out there that you love that I missed here? I'd love to hear from you! I love Young House Love. We are getting to move into a new home and seeing their house transformation pics has me up all night planning the new look for our home. Thanks SWOON GIRLS!!! Hi Shanna! Just wanted to let you know that you got me addicted to YHL!